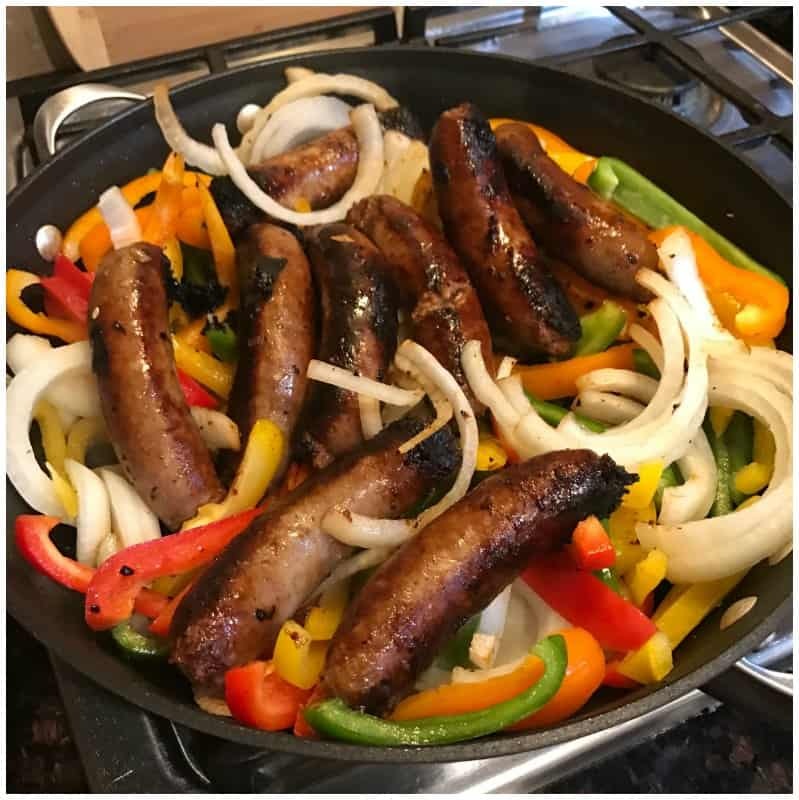 I have been making Sausage and Peppers Appetizer for the Big Game for the last 3 years in a row. It’s simple and everyone loves it! I guess when you find a recipe that everyone enjoys, you keep at it. Besides, I want to enjoy them game too! 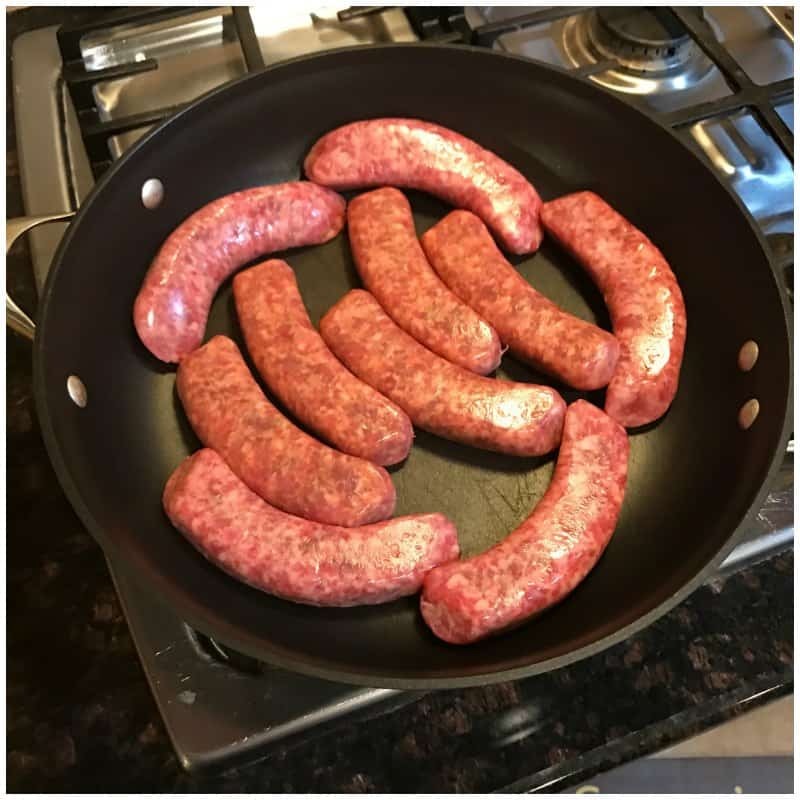 Now, I should mention that not any sausage brand will do. There is only one brand that has the most amazing flavor I’ve ever tasted. 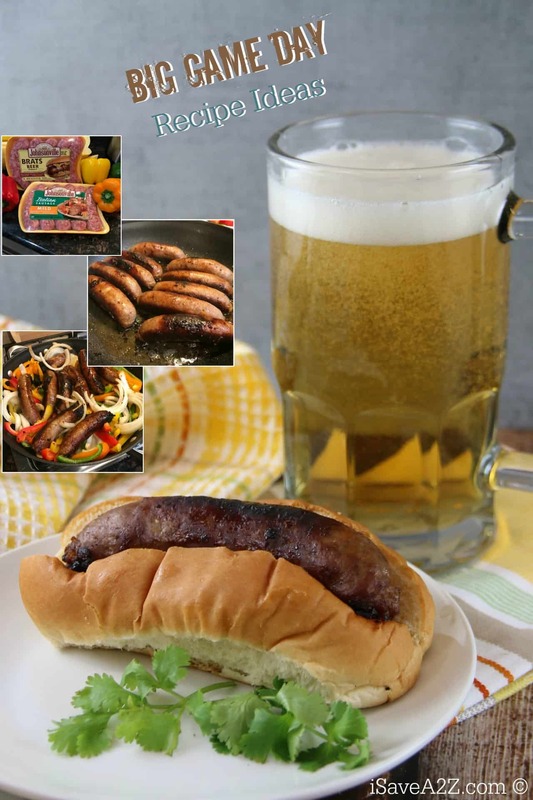 I only trust Johnsonville’s bratwurst in this recipe. 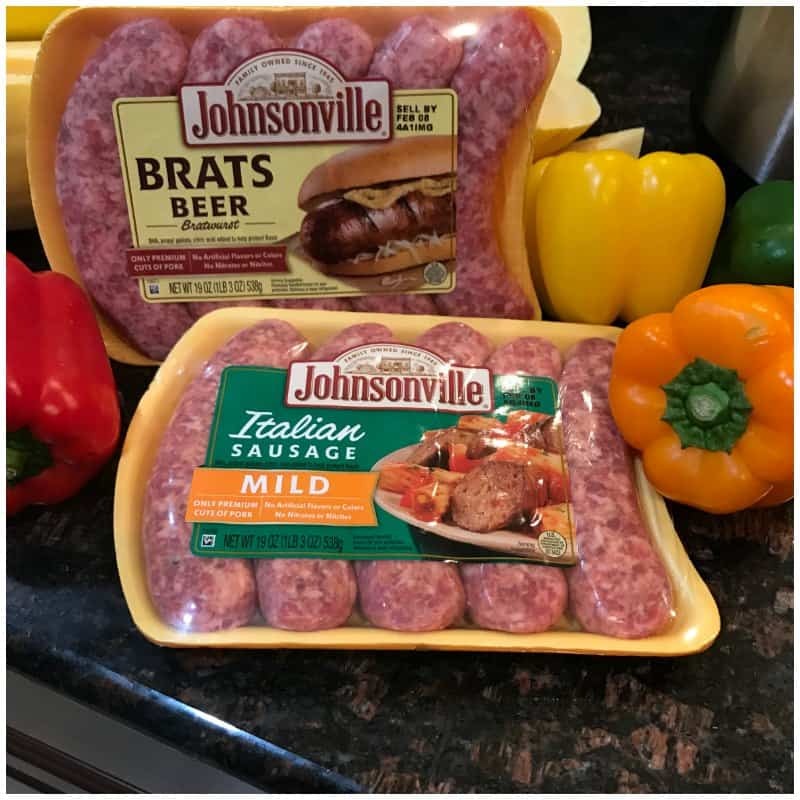 The Johnsonville Brats Beer Bratwursts are out favorites! OH! 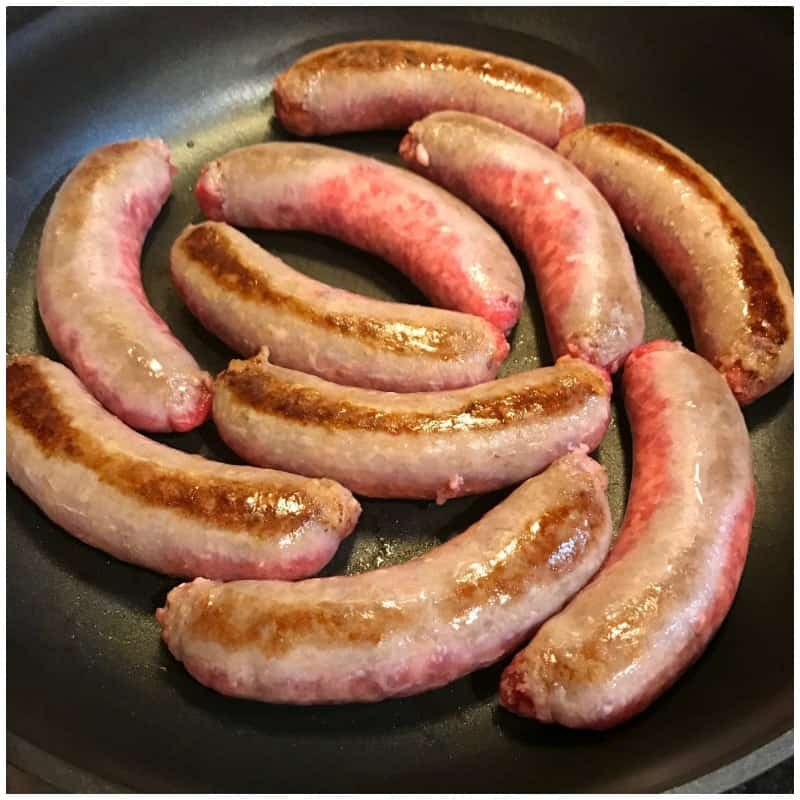 And… this sausage has enough flavor to season the rest of your dish too! Sometimes the hardest part of creating an appetizer or meal is the seasonings and there’s no guess work here. I start by prepping all the vegetables first. 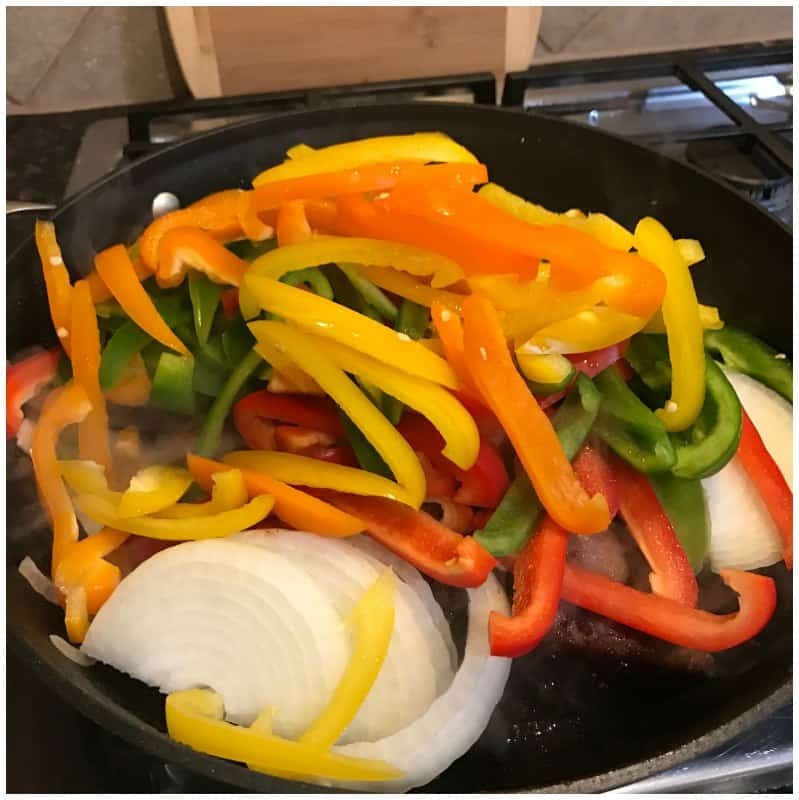 I dice the onions and julienne cut (long cut) the peppers. 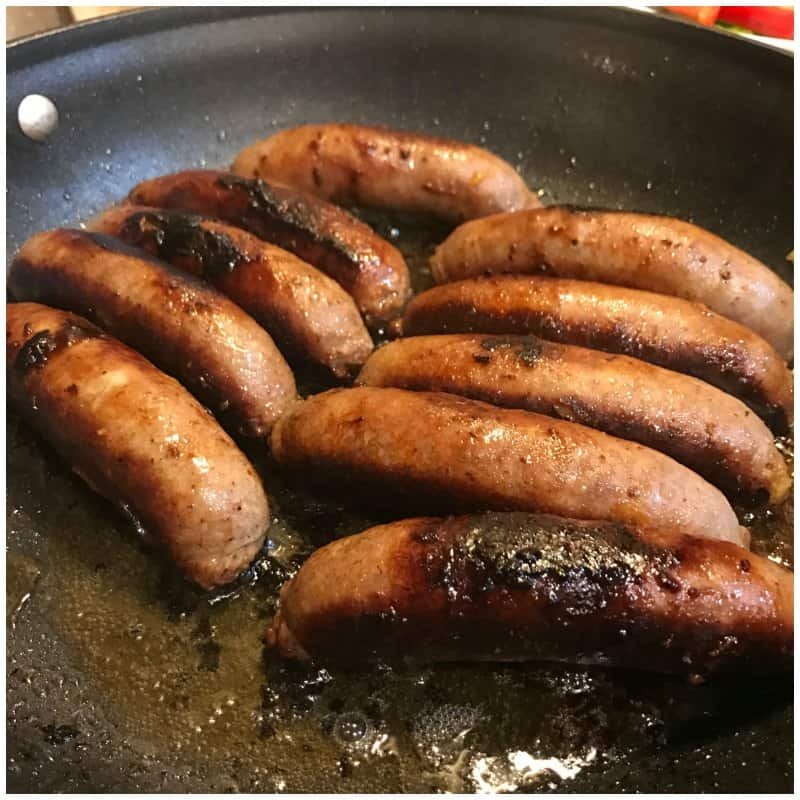 Next, I place all the sausage links in a large frying pan and cook them on low to medium heat for about 15 minutes or so. You don’t want to cook them on a high heat because the outsides of the links will burn easily. Slow cook them with a lid to trap the heat inside to allow them to cook evenly. 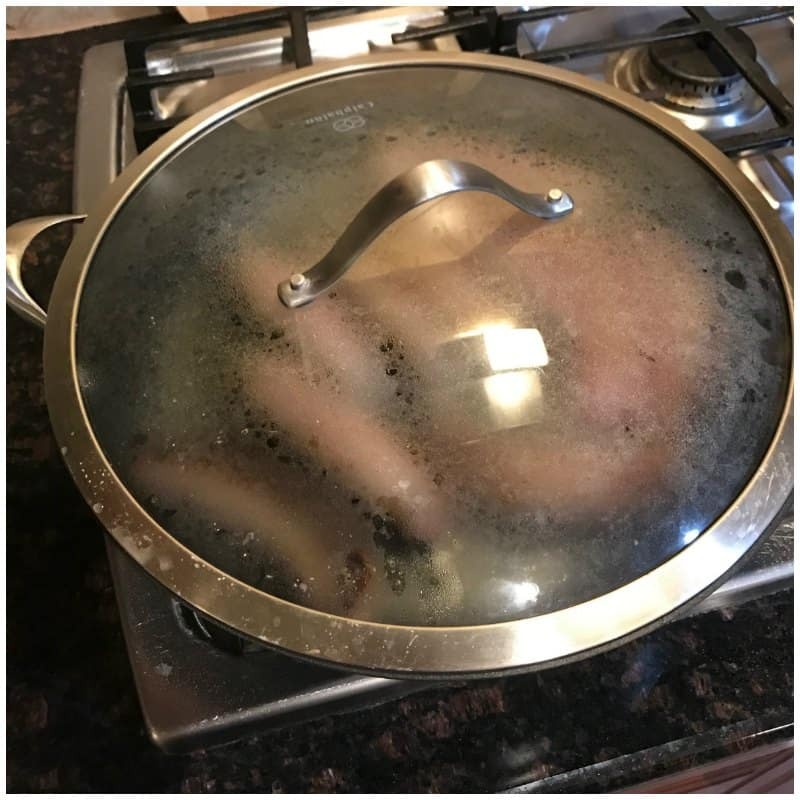 You can add a little bit of beer or water while cooking them. This is optional and not necessary though. Once the sausages are completely cooked, I toss in all the prepped vegetables and saute them. 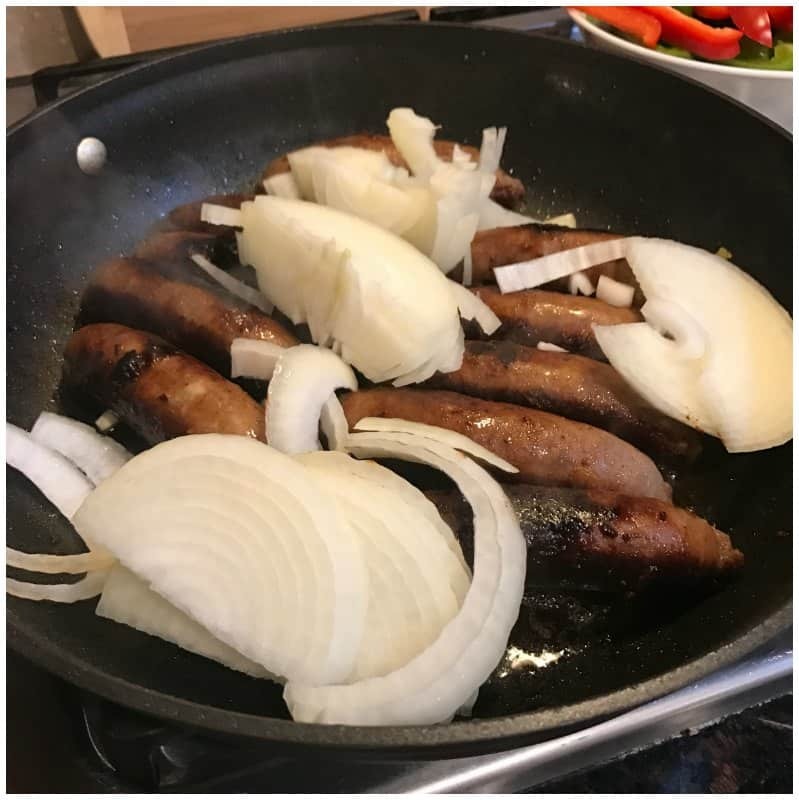 I remove the sausage links after about 5 minutes and let the vegetables cook in the seasonings and oil left in the pan. This is the best part! Be sure to add a bit of olive oil to coat the veggies. 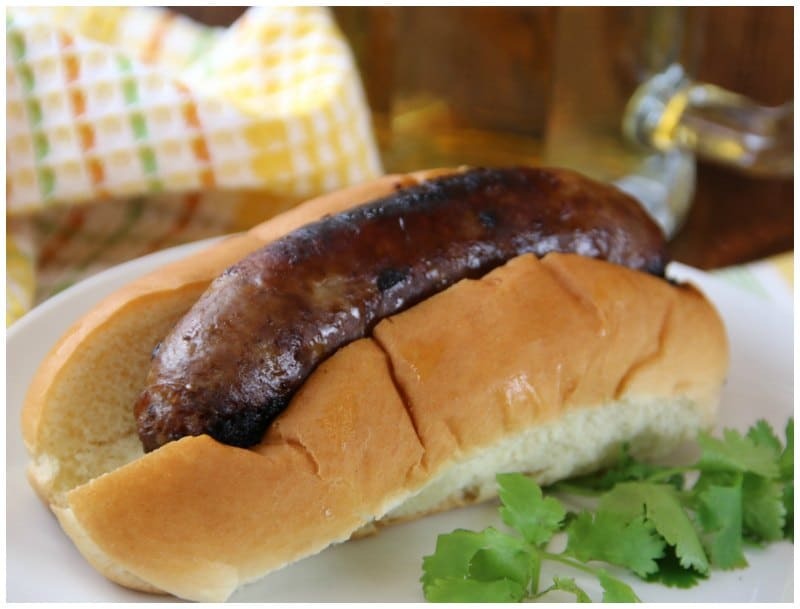 This helps pull all those amazing flavors left over from the sausage links you just cooked. You will cook the vegetables long enough for them to become soft and them they are ready to serve. 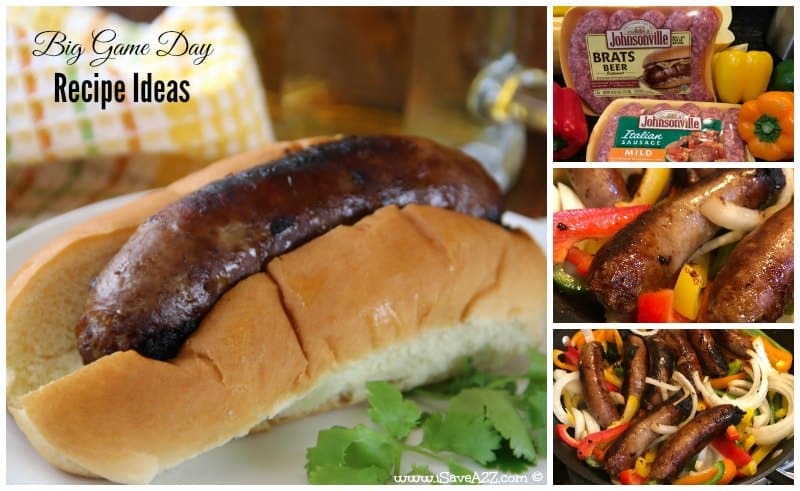 I tend to cut up the sausage links and place them over a plate of veggies but my husband prefers to eat the brats in a bun with a beer in hand. He’s definitely a meat and potatoes kinda guy. We love the vegetables with it and the flavors they create when made together. Easy recipes such as these are the key to a successful party! No matter who you are rooting for, good food and good friends always equal a great time! 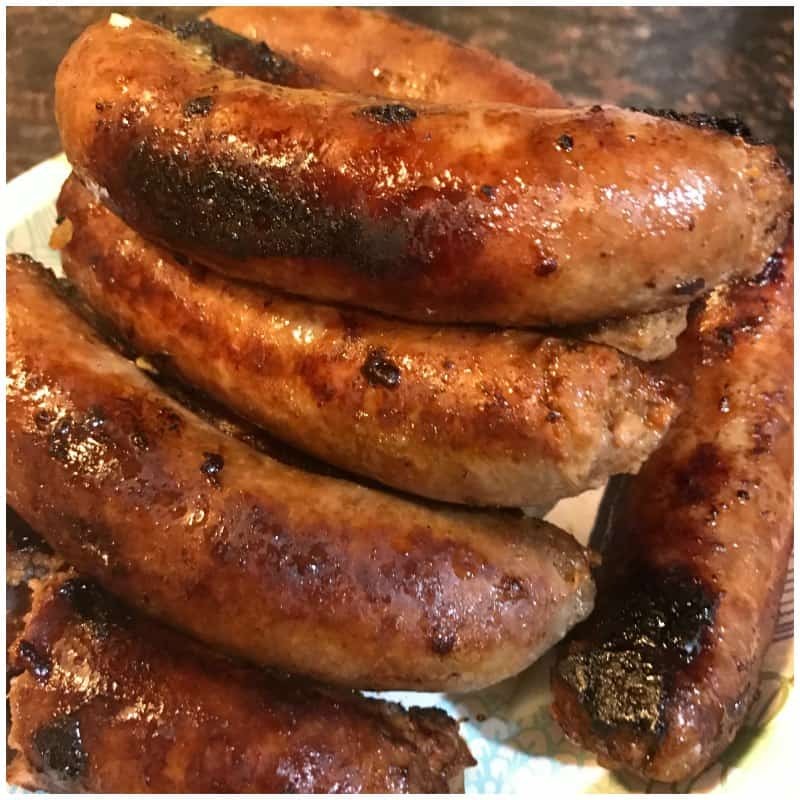 Be sure to visit http://www.sausagedome.com/ to view the latest episodes and find the best sausage recipes for your own game day spread. 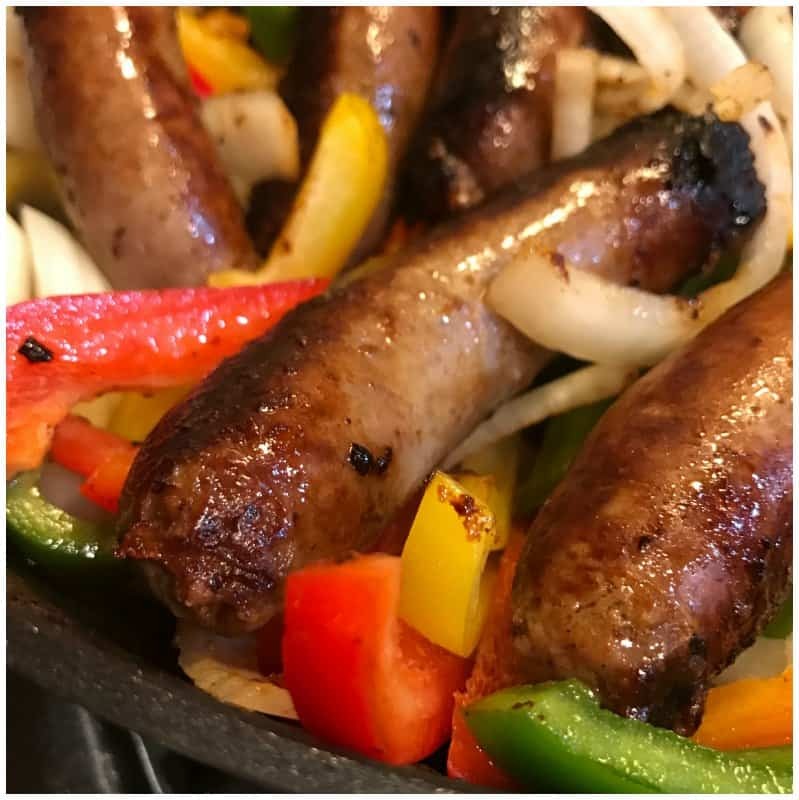 Cilantro Jalapeno Dip Recipe This dip recipe pairs perfectly with this sausage and peppers appetizer idea! 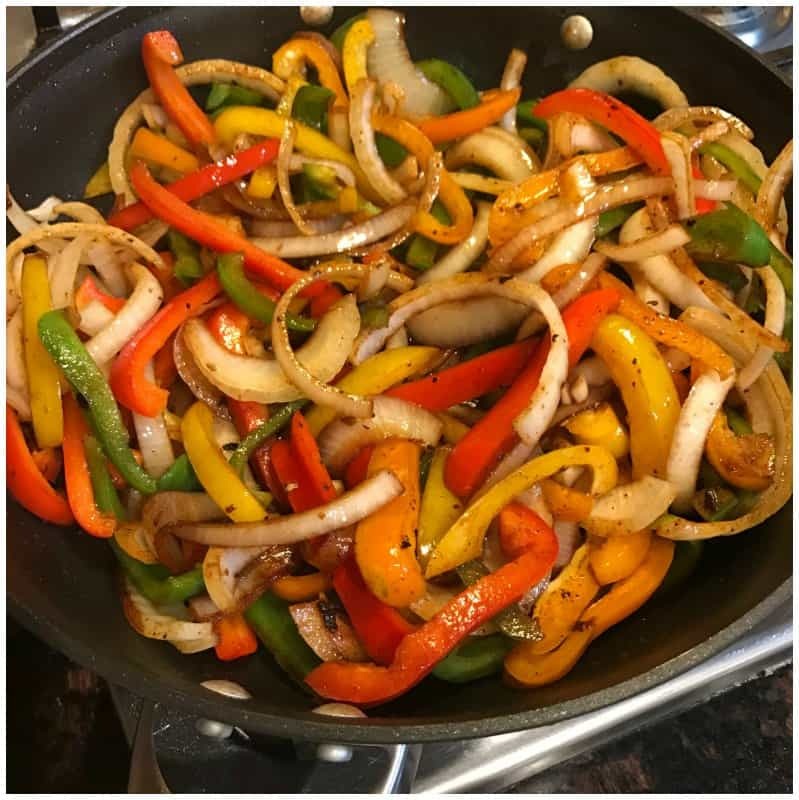 By Jennifer on February 2, 2017 Appetizer, Keto Dinner Recipes, Keto Lunch Recipes, Recipes.